What is the Christmas Web? Santa Sends One of His Elves Out to Spread the Word About a New Christmas Tradition. 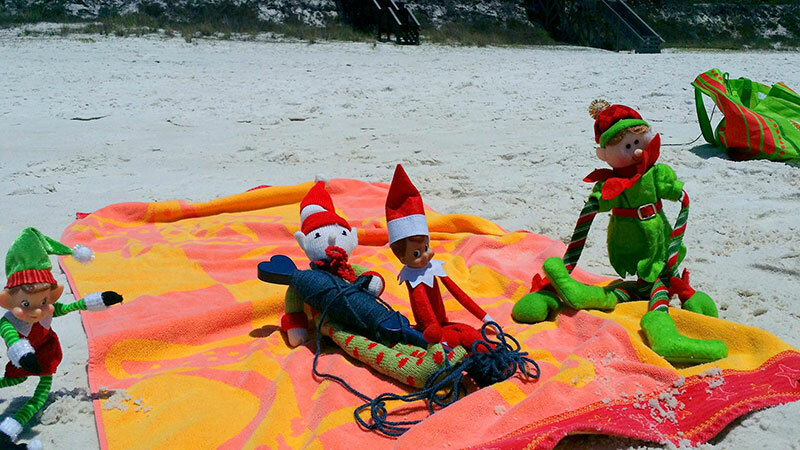 Lucie is a distant cousin of The Elf on the Shelf and has been working for Santa at the North Pole for 25 years now. Santa has wanted to come up with a way to insure that each and every child received their “Special Gift” chosen specifically for the child by their elf. The recent popularity of Elf on the Shelf has presented Santa with just what he’s been wanting, “Elf Help”. Mrs. Clause and the elves put their heads together and came up with The Christmas Web – A Family Tradition. When the children’s elves arrive shortly after Thanksgiving the elf puts a Magic Wand in each of the children’s Christmas stockings. The wand remains in the stocking, with a few exceptions initiated by the elf, until Christmas Eve. When Santa arrives, Santa and the elf hide the child’s Special Gift where no one else can find it; at the end of the Christmas Web. More Details Here. 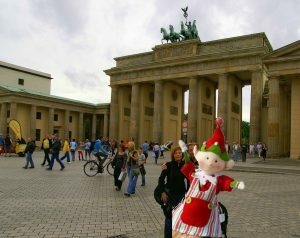 Lucie’s first stop on her task to spread the new Christmas Tradition , The Christmas Web, and Elf Ideas was Berlin, Germany. We take today’s Christmas celebration customs as ours, most of our Christmas Traditions only date back to the 19th century. Most of our current Christmas Traditions originated in Germany and Austria. One German Christmas Tradition the US has not adopted is the two-day celebration know in parts of the world as Boxing Day, the day after Christmas Day — der zweite Weihnachtstag. There are many other Christmas Traditions unique to German-speaking Europe. 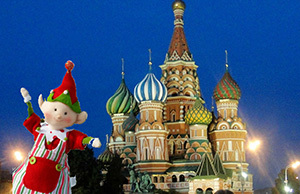 Lucie’s second stop on her task to spread the new Christmas Tradition, The Christmas Web, and Elf Ideas was Moscow, Russia. Not long ago in the days of the Soviet Union, Christmas was not celebrated very much it was frond on by the government and any celebrations had to be behind closed doors. Now in today’s Russia Christmas is celebrated on January 7th, this is because the the Russian Orthodox church uses the ‘Julian’ calendar for religious holidays. The Russian Orthodox Church also celebrates Advent, it has fixed dates, starting on 28th November and going to the 6th January, 40 days long. 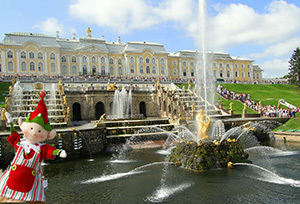 Lucie’s third stop on her task to spread the new Christmas Tradition, The Christmas Web, and Elf Ideas was Saint Petersburg, Russia. The Russian Santa Claus is named Ded Moroz, or Father Frost, he is accompanied by Snequrochka, the Snow Maiden, he brings presents to children and places them under the New Year’s tree. He carries a staff, like the German’s Saint Nichols, wears valenki, wool boots, and is travels across Russia in a troika, a sleigh brawn by horses. Lucie didn’t find many of The Elf on the Shelf in Russia. 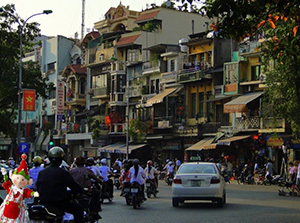 Lucie’s fourth stop on her task to spread the new Christmas Tradition, The Christmas Web, and Elf Ideas was Hanoi, Vietnam. Vietnam is a Buddhist country, Christmas in Vietnam is one of the four main annual religious festivals including the Lunar New Year, the mid-autumn festival, and Buddha’s birthday. Christmas Tradition in Vietnam is a huge event, Christmas Eve is more important than Christmas Day. It is a huge party for the fun-loving Vietnamese, whether they’re a Christian, Buddhist or Hindu they celebrate the Christmas holiday. 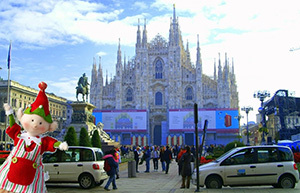 Lucie’s fifth stop on her task to spread the new Christmas Tradition, The Christmas Web, and Elf Ideas was Milan, Italy. Italian Christmas Traditions are based on the countries Christian heritage. The Christmas season starts seven days before Christmas Day and continues through the end of the year. On December the 23 the children dress as shepherds and go door to door with musical instruments entertaining the community, the home owners reward them with coins for them to buy Christmas treats. Italians then fast on December 24 and then eat a large feast on Christmas day, the feast is absent meat. Lucie did find some of her Elf on the Shelf cousins in Italy. Lucie also stopped at Lake Como while in Italy. 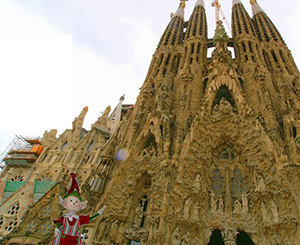 Lucie’s sixth stop on her task to spread the new Christmas Tradition, The Christmas Web, and Elf Ideas was Barcelona, Spain. Being a Christian country people in Spain go to Midnight Mass or ‘La Misa Del Gallo’ (The Mass of the Rooster) the night before Christmas. It is called this because a rooster, according to the Bible, crowed the night that Jesus was born. 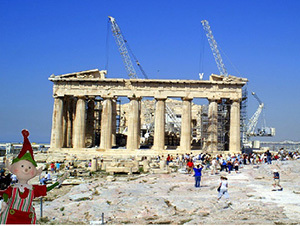 Lucie’s seventh stop on her task to spread the new Christmas Tradition, The Christmas Web, and Elf Ideas was Athens, Greece. Christmas Eve children go from house to house singing “kalanda”, Christmas carols. A fire is built in the fireplace to keep away Killantzario, goblins that come from the center of the earth and enter your house through the fireplace and make trouble in your home. They extinguish fires, jump on peoples backs, and sour the milk. Christmas Tradition also includes a feast of pig and christopsomo (Christ Bread), made in large loafs and engraved on the crust to depict the family’s profession. Like in America the Greek Christmas Tradition includes decorating a tree in the house but unlike the American Christmas Tradition the presents are exchanged on January 1, Saint Basil Day. 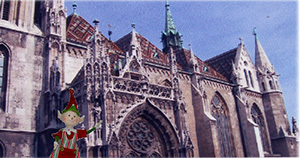 Lucie’s eighth stop on her task to spread the new Christmas Tradition, The Christmas Web, and Elf Ideas was Budapest, Hungary. Christmas Eve in Hungry is called “Szent-este” which means Holy Evening, this is family time when the Christmas tree is decorated. The main Christmas meal is eaten on Christmas Eve consisting of fish and cabbage and “Beigli” a bread-cake. After the Christmas meal most families go to Midnight Mass. Christmas Day is for visiting family. Another Christmas Tradition in Hungary is Saint Nicholas Day celebrated on the 6th of December. Children leave out their shoes for “Mikulas” who rewards them with candy and treats if they’ve been good and coal and switches if they’ve been bad. 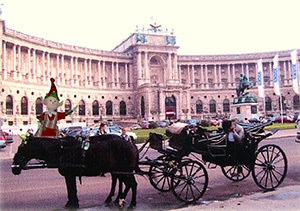 Lucie’s ninth stop on her task to spread the new Christmas Tradition, The Christmas Web, and Elf Ideas was Vienna, Austria. The Austrian Christmas Tradition starts around 4:00 pm on Christmas Eve (Heilige Abend) when the Christmas Tree is lit for the first time, the family then sings carols around the tree. Decorations include candles( electric), sweets including small liqueur-filled chocolate bottles, chocolates of various kinds, jelly rings and ‘Windbäckerei’, meringue, usually in the form of rings, stars. Lucie runes into a friend in Vienna. 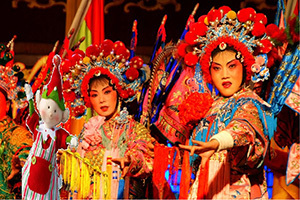 Lucie’s tenth stop on her task to spread the new Christmas Tradition, The Christmas Web, and Elf Ideas was Beijing, China. There are few Christians in China so Christmas Traditions are only found in major cities. There are some Christmas Trees with lights and decorations in department stores. Santa Claus is called “Shen Dan Lao Ren”. A growing Christmas Tradition in China is to give apples on Christmas Eve. In Chinese Christmas Eve is called ‘Ping An Ye’, which means Silent Night and the word for apple in Chinese is ‘Ping Guo’ which sounds similar. 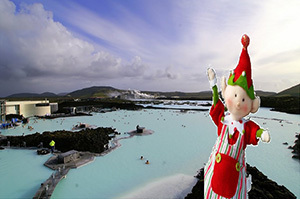 Lucie’s eleventh stop on her task to spread the new Christmas Tradition, The Christmas Web, and Elf Ideas was Iceland. Christmas is called ‘Yule’ in Iceland and there are many Yule Traditions is Iceland. December 23rd. is Saint Thorlakur’s Day, the tradition is to eat a simple meal of skata or skate, the Yule Tree is also decorated. and it is a big last minute shopping day. Yule Eve starts a 6:00pm; Icelandic children open their presents after the Yule Eve meal. Yule Day is celebrated with the extended family with a feast or ‘Hangikjot’ a leg of lamb and ‘Rjupa’, rock ptarmigan, a sea bird. Luce did find some of her Elf on the Shelf cousins in Iceland. 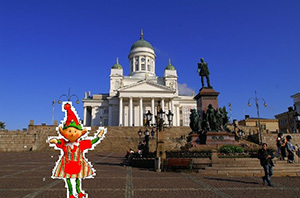 Lucie’s tenth stop on her task to spread the new Christmas Tradition, The Christmas Web, and Elf Ideas was Helsinki, Finland. Santa lives in the northern most part of Finland a place called Lapland, north of the arctic circle, so Lucie was close to home here. Santa is know as Joulupukki, which means ‘Christmas Goat’. This dates back to a Yule Goat that used to ask people for presents, not give any out, with time the goat became a gift giver and Santa took over from there. Today Joulupukki has a sleigh pulled by reindeer and he leaves gifts under the Christmas tree, but if you’re bad he leaves a bag of coal. Oh my gosh! I just found a new family tradition to share with my grandkids. Christmas Day usually finds me here in Florida and them in Ohio. ~~sad face~~ However, I do see them in early December. My first thoughts when I received The Christmas Web to review was to figure out which family to give it to. Then I opened the box and checked the website for more information. Once I realized exactly what it is I decided that I’m not giving it to anyone. It will be my new tradition with my grandkids, kind of to make up for not being there on Christmas Day. It will be so much fun! 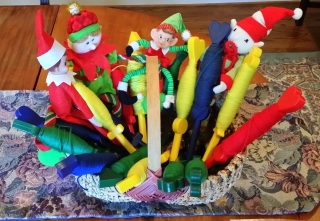 We’ve used the elves as supporters of our family values, thus making the month of December and the arrival of Elf on the Shelf and the other elves not only a fun activity but a learning experience as well. 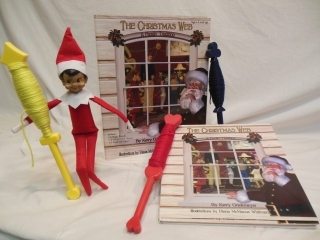 Below you’ll find some of our Elf Ideas which include a variety of elves not just Elf on the Shelf. You can see all of our Elf Ideas here. Using the Elves to teach our family values as a part of our Christmas Holiday Tradition seemed like such a good idea the we decides to extend the teaching of family values into the balance of the year. We kept with the reward theme and we continued to try to keep The Christmas Web involved as an extension of the elves actions. Here’s some of our throughout the year Elv Ideas. Twenty years ago as Kerry Grinkmeyer and his wife geared up for the holiday season, the Mountain Brook couple felt that something was missing. As they rushed around to get everything ready the holidays, they couldn’t help but think there was more to the season, Kerry said. The couple’s 23-year-old son was due home from college, and their daughter was a senior at Mountain Brook High School and about to spend her last Christmas at home before embarking on her own college career. 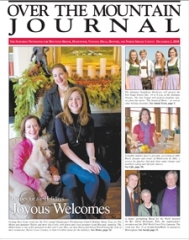 The Christmas Web in the December 2012 issue of Staten Island Parent. The Christmas Web is included in a seasonal product roundup that highlight The Christmas Web as a way to create a more entertaining and exciting Christmas morning for the family. An image and the price point of the product was included in the piece. A Christmas Morning Tradition - Santa's Grand Finale!